Go nuts and seeds about your kids. I’m not kidding. These two little nutritional power houses will keep your munchkins healthier than you ever imagined. All the healthy oils they need in their diets can actually come from nuts and seeds instead of unhealthy dairy and vegetable oils. High protein nuts and seeds are a win-win when it comes to the health of your kids. These foods are filling add fiber to anything you add them to and teach kids about some of the best things on the planet to eat in the palms of their little hands. There are so many kinds of nuts to love and choose from. Nuts grown on small bush like plants and trees and in so many places on the globe. Shelled or not, salted or not, spiced up or down, they are a power house snack for anyone. Aside from kids with tree nut allergies, all kids should have them added to their diet. I can’t emphasize enough that kids eat mostly what you put in front of them from early on when they are learning and watching what we as adults are eating and serving ourselves on the plate. They may grow to have preferences for certain nuts over others but all 5 of munchkins have a love for nuts, seed and trail mixes for quick snacks that give them lots of energy. All the dried fruit in most trail mixes has sulfur dioxide in them as a preservative so I avoid it whenever possible and get organic dried fruit without the sulfur dioxide. You can also buy organic mixes or get the individual nuts and dried fruit and make your own. Keep nuts and seeds in the refrigerator to prolong shelf life especially if organic without the preservatives or put in freezer until needed. Small quantities can thaw overnight for use the next day. Whether it’s sesame seeds sprinkled into or onto soup or adding them to oatmeal in the morning, they are a good source of fiber and vitamins and minerals. These seeds are considered the oldest oil seed crop in the world and have been cultivated for more than 3,500 years. They are commonly added to salads as an ingredient or topping for bread and grain products, crackers, sushi, cakes, soups, breading for fish and meat. The health benefits of sesame seeds are due to their dense nutritional content including many vitamins, minerals, natural oils, and organic compounds which consist of calcium, iron, magnesium, phosphorous, manganese, copper, zinc, fiber, thiamine, vitamin B6, folate, protein, and tryptophan. They come in different colors and are delicious toasted in a pan with a little coconut oil or dry until you smell their nutty scent then toss them in a soup or on a sandwich. They are also good in a smoothie. Chia seeds, Hemp seeds are two more healthy seeds to add to soups or the kids morning oatmeal after soaking them overnight. I personally mix up mine the night before in water with nuts seeds diced up fruit like dates and apples and of course the oatmeal (quick oats organic when available) served with a tsp of maple syrup on top and a sprinkle of cinnamon and powdered peanut butter. For each nut, you can see the macro nutrients and the amounts of omega 3 and 6 above. Omega 3’s fight inflammation in the body and omega 6’s if taken in at a higher degree than omega 3’s can promote inflammation and cardiovascular disease over time. You will also find a list of the six most important vitamin/minerals each nut contains and a summary of the benefits and drawbacks if any. Almonds originated in the Middle East. They are one of the healthiest of nuts and packed with beneficial nutrients. 1. There are large amounts of fat in Almonds and a moderate amount of protein and carbohydrates. 2. A major benefit of almonds is their positive effects on blood sugar. They are known to reduce blood sugar and lower insulin levels which is important in diabetics and in the rest of us to help prevent pre-diabetes from developing. 3. Metabolic syndrome is increasing every day and includes diabetes affecting every organ in your body, so this is the most important health benefit with Almonds. 4. People eating almonds regularly show lower levels of oxidative damage on a cellular level, a healthier lipid profile, and higher satiety levels. This means eat almonds 1-2 oz per day and you might have a better chance staying off medication for high cholesterol and you will eat less of the bad processed food that can harm your health if eaten on any regular basis. Almonds contain a large amount of phytic acid, a known anti nutrient which can block minerals absorption. However, phytate (or phytic acid) has both positive and negative effects on health and is likely beneficial in small amounts. The key: stick to a sensible amount. (2 oz per day) I eat a few nuts most days of the week as do my kids, so keeping each type down to 2 oz per day is likely going to keep you from over doing it on nuts for the day. Compared to other kinds of nuts, the omega 6 to 3 ratios in almonds is the highest. However, providing you’re getting enough omega 3 from oily fish (wild only) and pastured animal foods (preferably pasture raised and finished), a few servings a week should be fine. As you can probably guess, Brazil nuts originate–and still mainly grow in the Brazilian forests. Brazil nuts are the biggest out of all types of nuts and they are the world’s biggest source of dietary selenium. Brazil nuts are the single best source of selenium in the world, an important mineral for health. However, some people are becoming deficient in it due to selenium soil depletion; just 2 or 3 Brazil nuts provide a huge amount of the mineral. Remember, nuts are the gems of nature, a concentrated source of many micro nutrients so it only takes a few of each kind every day or even 3-4 days per week to reap the benefits of all the richness they offer our bodies. Eating Brazil nut improves the body’s antioxidant status. Studies have shown that Brazil nuts decrease oxidative stress and improve the lipid profile. Similar to almonds, Brazil nuts also contain a large amount of phytic acid. Brazil nuts contain such a high amount of selenium that there have been concerns over potential overdose and toxicity issues. In a trial, school children eating 15-30g per day– all of their selenium levels were too high and this is associated with toxicity risk (selenosis). This is not commonly a risk in areas outside of Brazil as it isn’t a nut that is eaten by kids usually in any quantity in the USA. With Brazil nuts, less is definitely more; a handful per week is more than enough. They are definitely one of the most popular varieties of nut and contain a nice mix of nutrients. Cashew nuts provide a decent source of copper, manganese, and magnesium. These are all micro nutrients important to cellular function. One randomized, controlled trial looking at the effects of cashew nuts on the metabolic syndrome( where people have diabetes, high BP and are obese with insulin resistance ) found that cashew nut intervention diets had no effect. Compared to the control group, the cashew nut group failed to show any improvements in cholesterol, blood pressure, or blood glucose readings. Cashew nut allergies are very common, and they can be even more serious than peanut allergies. For example, several studies have shown that the risk of severe reactions, including anaphylaxis, are more common than in allergic reactions to peanuts. Something that isn’t talked about much. Cashew nuts are much higher in carbohydrate than other nuts, making them a poor choice for those who are focusing on low carb foods. 4. Chestnuts (per ounce / 28g) Starchy Not like most other nuts. 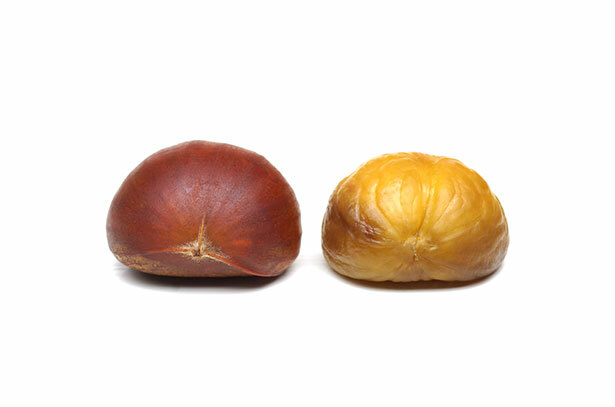 Chestnuts are different to other kinds of nuts in that they are predominantly a starchy carbohydrate. We did purchase some this winter and my 7 year old was so excited to get to roast them and try them. They tasted meaty and good. Because of this fact, if you’re looking for healthy fats then it’s better to look elsewhere. They taste great, particularly on a cold winter’s day. Chestnuts provide a decent amount of manganese, but there aren’t any other standout nutrients. Also, the positive health impacts are small in comparison to other nuts — very few studies show any significant benefits. Chestnuts are very high in carbs and low in fat; the very opposite of most nuts! In other words, don’t think of them as a source of healthy fats — they are not. As one of the most popular types of nuts, hazelnuts are delicious and used in all kinds of food products. They are one of the most nutritious nuts around and have numerous research-backed benefits. Hazelnuts have protective effects against cardiovascular disease. In fact, participants consuming a hazelnut-enriched diet have improved arterial dilation, reductions in LDL and triglycerides, and increases in HDL. Furthermore, oxidized-LDL ( the kind you don’t want) levels and inflammatory markers are “significantly reduced” This means less cardiovascular disease risk. There aren’t many with hazelnuts, but similar to all nuts they can cause allergic reactions. And sometimes these effects can be severe. Talk to your Doctor or Allergy Specialist if other nut allergies are a problem before eating these as well as cashews and peanuts and almonds. Macadamias are fairly expensive, and they are one of the least nutrient-dense types of nuts. However, they are the most delicious. With a yummy, buttery taste, no other nuts come close. Two of my kids go crazy over these. It’s like they melt in your mouth. The taste. Is there a tastier nut? Not many foods top macadamias! They are some of my kids favorite nut. 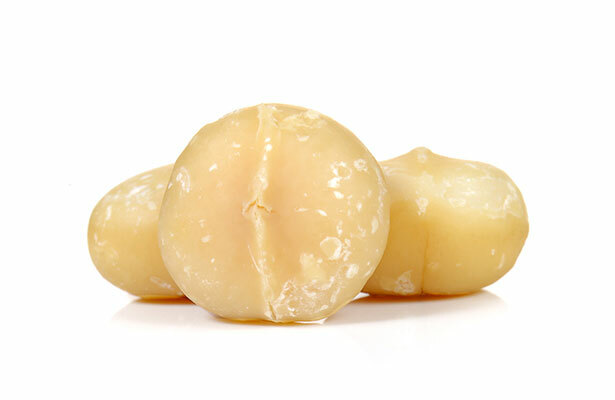 Macadamias are very low in carbohydrate and high in fat, with an insignificant amount of omega-6. As most nuts contain a large source of omega-6, this can be helpful for those trying to watch their omega 6 to 3 ratio. Macadamia nuts contain virtually no phytic acid. Consumption of macadamias decreases the risk of cardiovascular disease by reducing triglycerides and increasing HDL levels. These issues are more applicable to older children and adults with cholesterol problems. Unfortunately this is affecting people at younger and younger ages. Animal studies show that macadamia nuts reduce inflammation and aid in muscle repair following strenuous exercise. 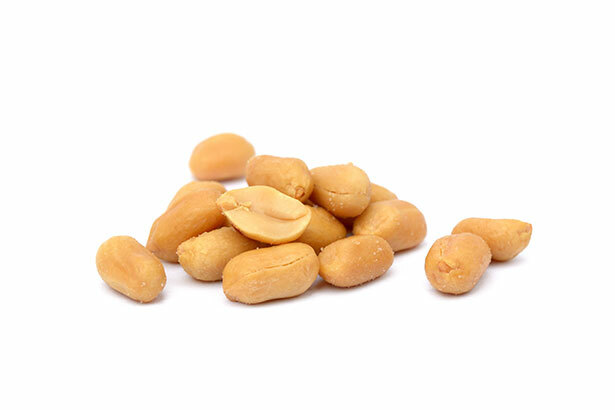 Although they are technically a legume, peanuts are one of the most popular sorts of ‘nuts’. Peanuts are not technically a nut; they are really more like a legume. However, because most people know them as a nut, they make the list. A cardiovascular risk intervention group were given peanuts for a 3 or 8-week study. Participants all experienced lower triglyceride levels and increased serum levels of minerals, particularly magnesium. Peanut butter is a tasty and (depending on the product) healthy way to get more nuts into the diet. Peanut allergy is a very real, prevalent, and potentially a serious life threatening condition. This allergy effects approximately 1% of infants and 0.6% of children, and it can be fatal. Pecans are one of the most popular types of nuts for baking and for dessert, they taste just great on their own. Pecans are a chart topper as an antioxidant-rich nut. Studies show that these antioxidants are absorbable and make our immune system strong. Research shows that daily consumption of pecans reduces triglyceride levels (-11%) and increases high-density lipoprotein (+6%) – which is a good thing. Pine nuts are one of the least common nuts but they are one of my favorites. They are so good spread across a pizza, on salad or just a handful by themselves. Despite this, they are increasing in popularity over recent years and have several health benefits. Pine nuts provide an excellent source of manganese. Similar to other tree nuts, pine nuts contain a range of health-protective polyphenolic compounds. Pine nuts may help improve mitochondrial oxidative metabolism, showing promise for use as a tool to fight obesity. Pine nut allergies are prevalent and often result in anaphylactic shock- making emergency medical care necessary. Cacogeusia, also known as “pine mouth,” is sometimes a problem with pine nuts. After eating pine nuts, some people experience a metallic or bitter taste in their mouth. Surprisingly, this can last for up to two weeks, and other symptoms include cramping and nausea. 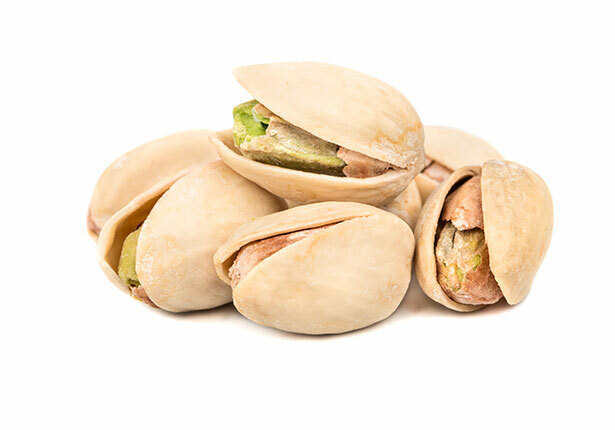 Different from other types of nuts, pistachios usually come in their shell. They originate from the Middle East. Replacing high carbohydrate snacks with pistachios significantly reduces triglyceride levels. Pistachios may have a positive impact on exercise performance, and on oxidative stress levels after exercise. Trials show that one daily serving of pistachios significantly lowers LDL-oxidation in patients with high cholesterol. The source is important – it isn’t unusual for pistachios to contain aflatoxins (mold) over the legal “safe” limit. Make sure and keep them in the refrigerator and check the expiration date before buying them. Walnuts predominantly come from China, and they are one of the most popular types of nuts. Not only are they used as a snack but they are also a major ingredient in a wide range of recipes. Walnut consumption improves endothelial function – making the lining of your blood vessels healthier, decreases blood pressure, lowers blood glucose, and reduces diabetes risk . The PREDIMED study of 7447 elderly participants found that eating walnuts decreased cardiovascular risk and increased longevity. 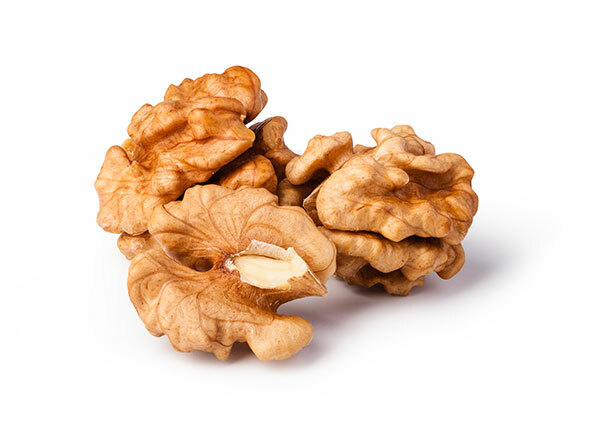 Walnuts have significant amounts of phytochemicals and healthy fats. Most importantly, they seem to have positive effects on brain health and help improve cognitive function. The omega 6 to 3 ratio is the smallest out of all nuts. However, there is a large amount of omega-6; 10 grams per ounce. Similar to most nuts, serious allergies are possible. What Are the Best Types of Nuts? Generally speaking, eating any variety of nut is going to have a net positive effect. All nuts are full of healthy fats, and the majority contain significant amounts of polyphenols. However, if you’re looking for the most nutritious nuts, then almonds and Brazil nuts are an excellent place to start. On the other hand, if your priority is the best tasting healthy snack then there’s only one option: macadamia. Best price at Amazon here. To sum up, you won’t go wrong with any of these options. Any type of nut is a healthy choice. Enjoy nuts often but in small quanitities as they can make you gain weight if over consumed. A Small hand full of mixed nuts in a baggy for kids lunches is a hit, especially when mixed with raisins or chopped dates and/or other dried fruit with the sulfur dioxide added. Read labeling carefully- you want the package without this preservative. Go crazy with special treats like cookies and nut breads once in awhile. Your kids will love them and stay healthy with nuts and seeds in their diets regularly in some form. Some fun with sweeter nutty treats is part of a healthy childhood. Stay happy and healthy. Happy New Year. Oh my gosh, I have to bookmark this! I am a fitness advocate and I find your article very helpful. The information about nuts will help me gain muscle mass and burn fat. I have been wanting to create the perfect snack, and your knowledge has helped me a lot. Thank you! I’m always happy to see someone get excited about the health benefits of nuts and seeds. They have been a staple at my house for the last 10 years at least. I agree this type of snack will keep hunger at bay, add healthy protein to someone like yourself before and after work outs, as well as provide the right type of oils in your diet to optimize your overall cardiovascular health and ensure absorption of fat soluble vitamins. Let me know what your favorite nuts and seeds are and if you try out the cracker recipe presented in the post video. They really are a great delicious snack. Share any of your own wisdom in the area please. Thank you.